When we started developing recipes for outdoor cooking and backpacking, nearly all our recipes the first couple years were for the method called Freezer Bag Cooking™, or also known as FBC. When asked “What is FBC?” the answer is it is making your own meals, just the way you want. Consider them to be similar to commercial freeze-dried meals, but without the cost, and you can customize them exactly to how you want. Have dietary restrictions? No issues. Want a smaller or bigger appetite? Easily changed. 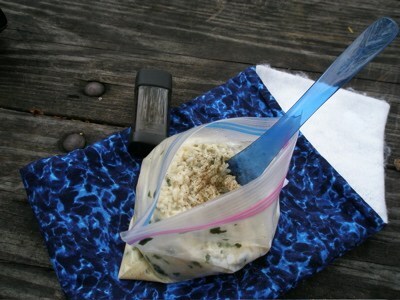 Most people who do the FBC method will package their meals at home before the trip. You will want to note on each bag what the meal is and how much water is required. Some will tuck a tiny note inside, others use a permanent marker on the outside. When getting ready to “cook” your meal, bring your water to a near boil. Pour the water into your cup to measure, then add it to your freezer bag. This way you avoid the chance of burns, adding too much water, or touching your freezer bag with a burning hot piece of metal – and having the small potential of melting the bag. You DO NOT need boiling water to rehydrate meals! Boiling is at 212°, 180° water will work just fine. If you need to boil your water to remove any chance of water born pathogens let it cool for a couple of minutes and then proceed. Stir with a long-handled metal, wooden (bamboo) or heat safe plastic spoon. After you have mixed it well, zip up the bag tightly and wrap in a fleece hat, jacket or cozy made for the purpose. Then let sit for 5 to 15 minutes (the recipe and altitude will determine how long), make yourself a drink and wait for your meal. Once ready, stir well and eat. We usually put our freezer bag into our cozies before we add the water (since we use a dedicated cozy), this works well as we don’t have to hold the bag upright while the water is added. If you squeeze or knead your bags to mix up the food, be very careful – be sure you have pushed out all the air before you do this. The steam from the hot liquid can cause a build up and your kneading could cause the bag to pop open. For items like mashed potatoes and stuffing kneading if done carefully works well. This can take a little practice, but after your food is ready, roll the top 1/3 of the bag down (imagine you are cuffing socks). This will make your bag into its own bowl. If eating soup or chowders, be careful. With a sharp camp knife cut off the top half to make a “bowl”. Many of the recipes are listed as feeding two people, which might make one wonder, how do you feed 2 our of 1 bag? My answer to this has to been to bring two bags with me – an extra bag (usually recycled from having held dry food before). After the meal is ready, I do the final stirring, then divide the meal between the two bags. Not Into Freezer Bags, But You Want To Do The Recipes? • See the section on the one pot method. • See the section on insulated mugs. • Gladware®, Rubbermaid Take-A-Longs®, or Rubbermaid® food containers that have a lid. If it is dishwasher safe, you can use it. These can be put in soft sided cozies. • Roasting bags and slow cooker liner bags, found in the plastic bag section at stores. • Food Vac bags, they are rated to be submerged in boiling water for extended periods and are some of the strongest bags on the market.